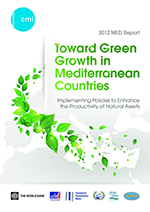 After 24 months of work, CMI, Femise and partners have released their report on the green growth potential in the Mediterranean, entitled “2012 Med Report: Towards Green Growth in Mediterranean Countries: Implementing Policies to enhance the productivity of Natural Assets”. This thematic publication is the result of a joint collaboration initiated by the World Bank with FEMISE as coordinators in addition to other French Agency of Development (AFD), the EIB and the Bleu Plan. Presented in 6 chapters, the report address the issue of how green growth can achieve sustainable development by enhancing the productivity of natural assets while preventing the negative social consequences of Environment degradation, notably in terms of the fundamental issue of employment. The report is presented as a way to open the debate and issue for a call for action on environemental pressing problems in the region. 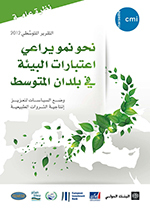 As presented by the Director of CMI, Mats Karlson, The 2012 MED Report: Towards Green Growth in Mediterranean Countries is the product of a cooperative and consultative process in which national policy makers, partners, experts, and local private stakeholders were invited to share their experiences and expectations concerning the issues facing the region. The need to discuss those issues in a published report was confirmed by public and private decision makers in regional and local consultations. Tackling the multidimensional challenge of growth in the context of a vulnerable natural environment requires cooperation, coordination, and a comprehensive set of measures.